Note to self: continue to read non-Sherlock Conan Doyle books. The Lost World was really awesome. I found it at a bookstore with the Lantzvillager, who recommended that I get it. It was a good recommendation as I thoroughly enjoyed this book. 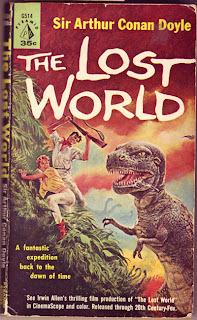 The adventure to the lost world plateau in the heart of South America was great, but I loved the public spectacle of scientific controversy in Edwardian London that bookened it even more. Good stuff. I don't know what's up with me this year, but I just can not get motivated to write my blog posts. Perhaps I pushed myself too hard last year, perhaps it's bigger issues. It's bizarre and I can't figure out what is going on (which is also bizarre). I do not want to lose track, though, so I will continue to log the books I've read and put up their covers. I found the Diamond Smugglers in the Maritimes. It was in terrible condition, but had such a cool cover that I picked it up. 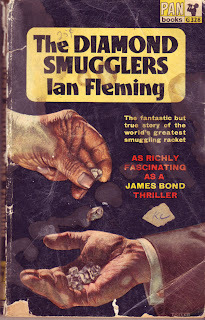 It assembles a series of articles Ian Fleming wrote for a Sunday paper where he interviews a top agent working against international diamond smuggling. There were some neat anecdotes and a fascinating picture of the diamond industry and black market in the world after WWII. There were some very disturbing and damning assumptions made about who had the native rights to the diamonds that reflect an ongoing colonial mindset. Neat book.